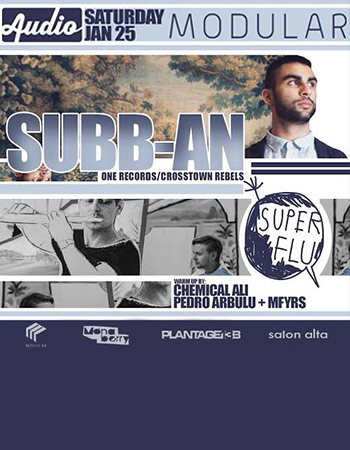 For our first event in 2014, Modular is bringing you a heavy weight double header featuring the very talented Subb-an and, as part of their “Halle Saale” new album world tour, the amazing Super Flu. The combination of the two for one night, on Audio’s crystal clear Funktion One sound system, is set to be one amazing event. Tickets: $10/$15 online, $20-$25 door. Subb-an’s rapid rise to prominence as a DJ, producer and one of the most exiting new British live acts of recent years is testament to his hard work, natural talent and wholehearted commitment to electronic music. Named as DJ Magazines ‘Best Breakthrough DJ’ in their 2011 end of year awards, Subb-an’s prodigious studio talents have seen him release on Crosstown Rebels, Spectral, Saved and My Favourite Robot and deliver much lauded remixes of Jamie Woon, Lana Del Ray, Noir & Haze and Hollis P Monroe over recent months. Outside of the studio he is a regular feature at clubs and festivals all over the world including fabric (London), Watergate (Berlin), Warehouse Project (Manchester), Movement (Detroit), D’Edge (Sao Paolo), The Electric Pickle (Miami), Just Jack (Bristol), The Harry Klein (Munich), BPM (Mexico), Space (Ibiza), Hot Natured at Sonar (Barcelona), The Garden Festival (Croatia), and Basics (Leeds). Subb-an is once again in RA’s top 100 DJ list for 2013. Performing alongside some of the world’s top electronic music artists, Moby, Max Cooper, The Martinez Brothers, Matthias Tanzmann and Martin Buttich, Pedro continues to connect to listeners with his heavily influenced sounds of House, Techno and Progressive. He draws his inspiration from the growing number of electronic music listeners around the world.